I am sure that all of you would know that today's post would be related to my Family Food Series. This is the 8th week of this series and If you have missed any of the previous one's check them here. This week's post is very special for me as this is from my mom.How can I not have any entry from my mom, especially when this is a family series?I was actually wondering how to get an entry from my mom for this series and when I was clearing off the photos in my folder I realized that I already had an entry from her. She had prepared this dish for me when she visited us last year and I had happily clicked the photos then.It is more than a year since then and although I have been waiting to post this for a while somehow I never posted it- could be because I wasnt with the pictures. I am glad that I didnt post them until now as this is the perfect time given the current theme. Coming to the introduction-I don't think that one needs to introduce their mother as everyone knows that MOMs are the best. Like everyone, even I am attached emotionally to my mom and I don't want to make this post an emotional one so let us just get to the recipe. Coming to today's recipes Bilavalige and Pithikipappu is the most famous breakfast combination of our community and is considered as a very special breakfast and is must to be made for important guests.This is quite a laborious breakfast and one needs to expertize in making perfect bilavalige,after all the most laborious recipes would be the best tasting ones right? 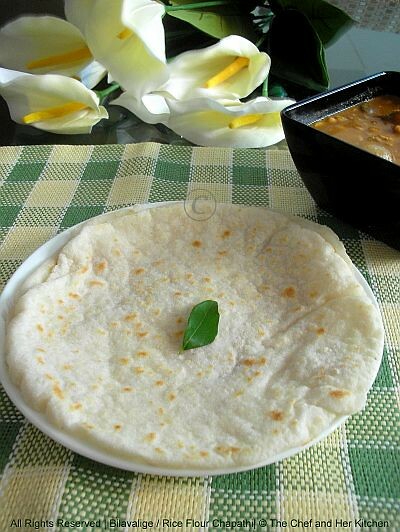 ?Bilavalige is nothing but rice flour chapati and is similar to akki rotti in karnataka but the process for making bilavalige is little different compared to akki rotti.Bilavaliges are rice flour chapatis which are white in color and extremely soft and they taste best when you eat them hot. Avarekalu is very famous in Bangalore and as it is seasonal we make sure that we utilize them to the maximum extent in the season.We make various varieties with it like pithikipappu,usli, kheer,halwa,rotti,upma,rasam etc.Try this truly delicious combination in the avarekalu season. Bring water to boil in a deep thick bottomed vessel and add salt and oil to it. Once the water comes to boil,mix a tsp of rice flour with 2-3 tsp water and add this to the mixture.This helps in not forming the lumps in the dough. Pour the rice flour into the water but do not mix it at all,leave the rice flour in water. Reduce the flame and let it cook for 15 mins. Now take a thick wooden stick(chapati rolling pin also works well here) and mix the rice flour into the water vigorously in one direction only.It will form a lump now and switch off the flame. Wait until the mixture becomes warm.It should not become cold,the whole process is to be done when it is hot.So take care not to burn your hand in this process. 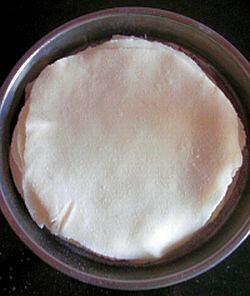 Wash and dry a polythene cover and place the mixture in it and knead it into a smooth dough.Place the mixture in a vessel and cover it with lid,take care not to cool the mixture.You can even knead the dough on baking sheet. Pinch in the dough and take orange sized ball and again knead it on the chapati stand.Rolling a rice chapati needs a lot of practice as the rice flour chapati keeps breaking while rolling.I am explaining two different ways to roll it,follow them which ever way you feel comfortable. Method-I for an experienced person:Sprinkle liberally rice flour over the chapati stand and on the kneaded round dough and roll it into a 6" dia circle using rolling pin like how we do rotis.While rolling keep pressing the edges to get a uniform round chapati and also use rice flour liberally while rolling. Method-II for a beginner:The easiest way to proceed for a beginner would be using a poori press.Clean,wash and wipe a polythene cover and cut into 5" dia rounds and grease the sheets on one side and place them on the sides of the press facing the oiled edges towards the center.Place the kneaded round dough and press it in the poori presser,you would get approximately 3" diameter round chapati.Now sprinkle rice flour over the chapati stand and on the kneaded round dough and roll it into a 6" dia circle using rolling pin like how we do rotis. Follow the same process of pinching the warm dough and kneaded the ball and rolling using two options.Pile up all the rice flour chapatis in a deep plate and keep it covered until you roast them.You can roll these rice flour chapatis much ahead before making them.You can even refrigerate it and fry them on next day. Heat the tawa and place the rice flour chapati on a hot tawa and roast it for a minute or so and turn it on to the other side and apply oil and once it is fried on the other side and apply oil and fry until you get to see small brown spots over it.These chapatis would be very soft and white in color with some brown spots.Do not over fry them,they will turn hard. Serve them hot with Pithikipappu or coconut chutney or Bagara Baingan or Mixed vegetable Kurma.The ideal combination we prefer with this chapati is Pithikipappu. 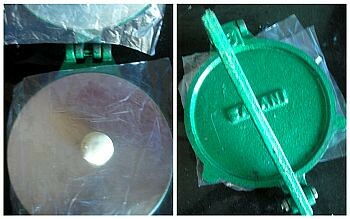 I have included few pictorials of my old posts for better understanding the process of making bilavalige. If the rolled rotis are refrigerated for half an hour before roasting them, they roast better. 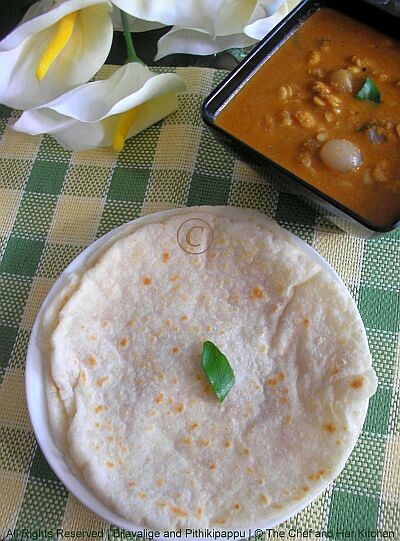 While refrigerating cover the rotis with a kitchen towel or place them in paper bag. Heat oil in a pan and add cinnamon,laung and fry and then add red chillies,coriander seeds,cumin and pepper and fry well. Add ginger and garlic and saute for a minute.Add khus khus,grated coconut and switch off the flame and just warm the fresh coconut and dry coconut and let it cool a bit. Roast one big onion with skin over the flame directly until the skin turns dark brown in color.Use tongs or fork for this process.Remove the skin and grind it along with the roasted masalas to a fine paste adding little water. 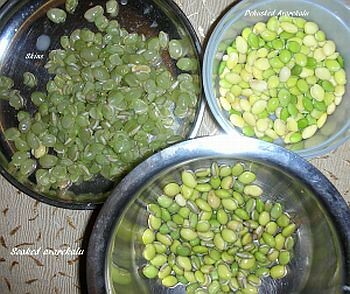 Soak mochai beans(avarekalu) in water for 4-5 hours or in luke warm water for 2 hrs.De husk outer skin and keep aside. 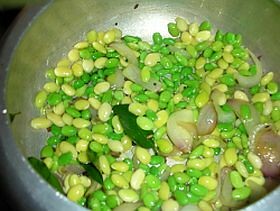 Heat oil/ghee in a pressure pan or cooker and crackle mustard seeds and add curry leaves and peeled small onions and fry until the onions change their shade. Add the dehusked beans and fry well until they turn light in color. Add ground masala and fry until good aroma comes and add approximately 1/2 cup water and pressure cook for 1 whistle. Allow the pressure to drop,remove lid and add salt,jaggery,tamarind pulp and add more water if required and boil for few minutes.The consistency should be similar to flowing dal. 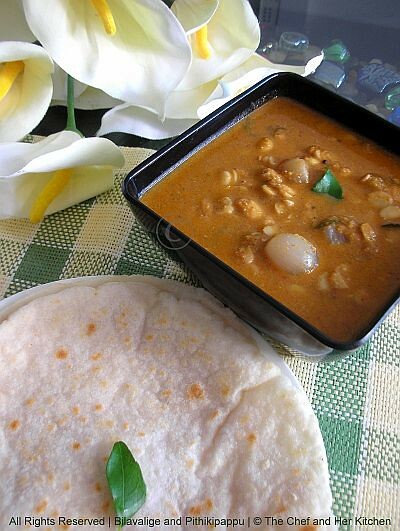 Serve it hot with rice flour chapati/rice/wheat flour chapati/poori.The ideal combination with this dal is rice flour chapati. If you do not get fresh avarekalu,you can even follow the same process with fresh peas for a variation.Even this tastes nice. wow i love the roti never heard of it.. i love these grren mochai but am getting them in markets..love it!! Sounds very nice,I have seen this roti in some other blogs too,it puffs up just like the wheat roti na? and the mochai gravy sounds so mouthwatering! I am amused how the same dish is named different and exists in so many cuisines!A very similar recipe is named as Pathiri in Kerala.We have a deep fried poori version of the same-method is the same,only difference being,the pooris are deep fried and not tawa fry.Lovely pics as always! looks yumm..and the side dish is so tempting.. I jus luv this pithukupappu pulusu.Its one of my fav.I will never miss this to buy and prepare during the season.I feel like having it nowitself.U've tempted me a lot. Prathiba, this looks beautiful. Thanks for sharing your mother's recipe. 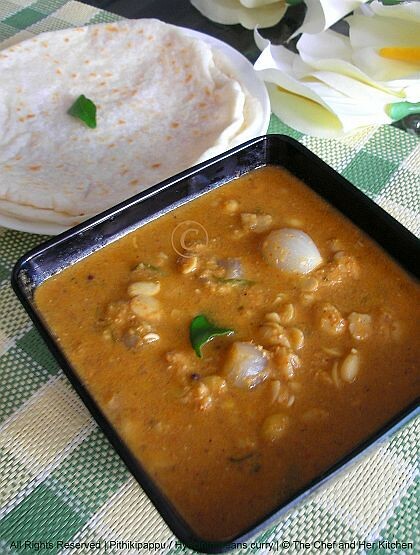 Both looks incredible, akki rotis are my fav, havent had since a long..wonderful dishes together..
You know, the rice flour chapatti is called pathiri in our region and it's a delicacy of the Malabar muslims :) The bean curry looks delicious! great job with this one..it sounds n looks amazingly yummmmmmm! Akki rotti tumba chennagide.. Truly delicious.. Yummy !! Very new to me...BTW sounds yummy! Though sounds not civil and I feel wierd asking this, I could not stop from asking. What do you mean by community special? @ Raks....Yes...these fluff up like rotis if done properly..They would be very soft,delciate and tasty compared to regular rotis. I absolutely love the combo, it looks superb. Especially the rotis, I love the process of making them. Initially I thought it must be regular dough, but nope it was that mixed in hot water one we usually use for chegodilu or I think you call it kodibolu or something. Lovely authentic dish. This series is such a lovely learning series and each week I really look forward for the Friday what is going to the special this week. Keep it going. People talk so much about gluten intolerance and all these rice rotis are a great boon for people on gluten free diet. You rock. It's my favorite combo looks so tempting prathibha. I am hungry again. Perfect rotis.. We call it as 'Pathiri' in Kerala.. The curry is new to me.. Looks yumm..
Lovely combo..both the recipes look great.. I have never heard about rice rotis. Thanks for sharing this detailed post on making rice rotis. It is really useful. And love that Mochhai curry. They seem to pair well. Wow .. rotis and the side dish looks so perfect and yummy. Nice clicks. Filling breakfast..Lovely roti, we call it pathiri...yummy with mochhai curry! Wow! Both dishes look amazing! Thanks for sharing these delicious recipes! Nice! looks simple enough for me to be able to prepare, and tasty enough to satisfy the kids' taste! Thank you! we make it so much at home my fav and we with aam ras and chutney ur gravy looks amazing!! I m glad that it turned out perfect for u dear...n regarding ur request,even I m in process of posting the shastralu recipe but I dont have the press and that is d reason its delaying..but I would do it soon for sure..otherwise I will send u d recipe if u want,mail to my id mentioned in the blog on the right hand side. raga,Even my mom told me the same,I think I forgot to mention in the recipe...anyways thanks for letting me know,I will update the recipe..
Can I use val dal that's available in Indian grocery in the place of pithikipappu. If so how to do it. @unknown...YES,you can use val dal of you get it..soak it for few hours say 3-4 hrs should do and follow the same process..Lemme know how it turned out. I tried this today..flopped out...coulfd nit roll the chapathis...was too sticky...did i add too much ewater?